In JDB, breakpoint is used to pause or stop the program explicitly. The purpose behind this is to acquire the knowledge about a program during its execution. The programmer inspects the test environment during this interruption to find out whether the program is functioning as expected. Breakpoint can be applied in a program on the basis of line number. The below syntax is used for it. It sets the breakpoint at the first instruction of the specific line. Breakpoint can also be applied on method or variable name. The below syntax is used for it. It sets the breakpoint at the beginning of the method. Note:- In the case of method overloading, it is required to specify the type of argument. 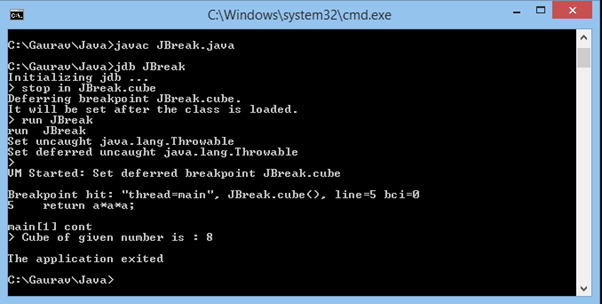 Through this example, we will try to understand the JDB breakpoint. fter the execution of this command, the following message will generate on console. The following result will be generated on your console. You can see that the execution stops at the cube method. Now, if you want the complete execution of your program with the desirable result then follow the below command to continue the execution. Once the complete execution is completed, the following output will be generated on your console.